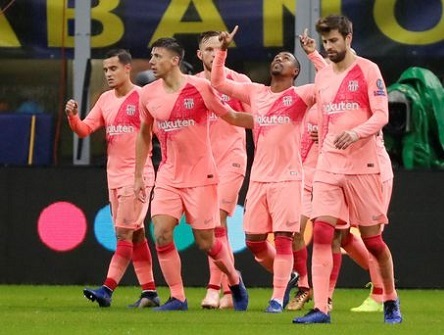 Barça remain unbeaten in Europe with 1-1 draw against Inter. FC Barcelona drew 1-1 away to Inter to remain group leaders and unbeaten in this year’s Champions League campaign. It was an entertaining scoreless draw before substitute came off the bench to give the Blaugrana the lead in the 83rd minute. It was an emotional moment for the new Barça player who chose a great time to score his first ever goal for the club in a competitive match. Unfortunately, Barça were not able to celebrate a victory as Inter’s captain, Icardi, scored the equalizer four minutes later as Barça fell victim to sloppy defending again. Barça can clinch automatic qualification into the knockout stage and first place in the group with a victory in Holland against PSV. Barça will now shift their attention to league play when they host Real Betis on Sunday as they continue to protect their status as league leaders. Inter: Handanovic; Vrsaljko, De Vrij, Skriniar, Asamoah; Vecino, Brozovic (Lautaro, 84′); Politano (Candreva, 81′), Nainggolan (Borja Valero, 62′), Perisic & Icardi. Barcelona: Ter Stegen; Sergi Roberto, Piqué, Lenglet, Jordi Alba; Busquets, Rakitic, Arthur (Arturo Vidal, 73); Dembélé (Malcom, 80′), Luis Suárez & Coutinho. Goals: 0-1, Malcom (M.82); 1-1, Icardi (M.87). Cautions: Rakitic (42′), Perisic (88′). Previous PostBarça fight back to defeat Rayo Vallecano 3-2. Next PostBetis defeat Barça 4-3 in a thriller at the Camp Nou.